HR: A fresh start for the #futureofwork – Adventures in Networking! When was the last time a conversation about (or with) human resources gave you…hope?! I ask this not only of executives, managers and leaders but of those of you who work in HR? It all started while I was washing dishes listening to this short Harvard Business Podcast. And it blew my fragile mind. 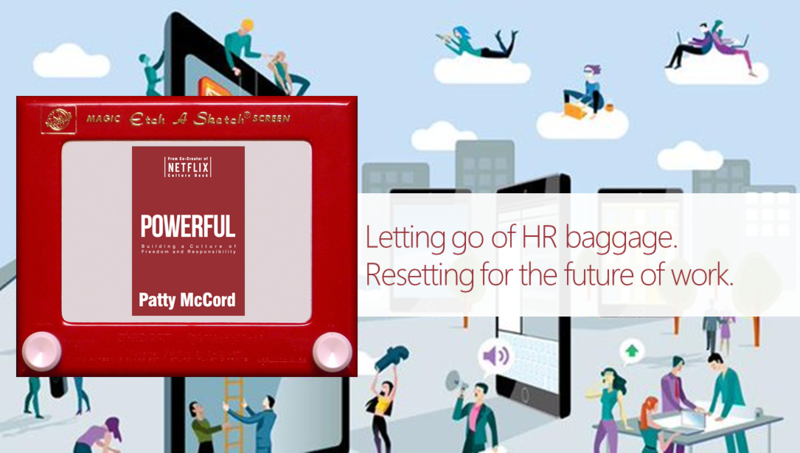 It was the single most modern, refreshing and human discussion on HR I had ever heard. We are now about a century into working in offices and having a person or dept. known as “Human Resources” – and in this time what this group of people does no longer resembles anything really “human” or even humane ( * see note). And this is half our problem, the incredible baggage of evolution! The evolution of management, technology, office architecture ( offices to cubicles, cubicles to open plan, open plan to remote work ) is all just part of the baggage that gets in the way of good HR. Not to mention the massive shift in “what is work”, “why do we work” and “how do we work” — there aren’t jobs for life and yet we still run so many HR programs with this assumption. Enter Patty McCord, 14 years at what is undoubtedly a modern corporate story – Netflix. Not just the Netflix of today, but the Netflix that started shipping DVD’s and then massively pivoted to streaming and changed the entire world of media. And in that growth, scale, pivot lies some highly valuable stories of hiring, retention, dismissal and parting ways well. Bottom line, this is a must-read book for executives, managers and leaders. Frankly, I’m not an HR professional so I don’t know how this will be taken by professionals in that sector. But as a manager for now a decade I can tell you this is the most refreshing and hope-filled read on this topic I’ve ever laid eyes on. What is so groundbreaking about this book? Bottom line, real professionals want to do good work. Purpose over perks. What people want most is autonomy, clarity, focus, responsibility. We aren’t a “family”, stop saying that – we are a team, tell us what that means to you, our leader. There are no more lifers in an “agile” business world, we are project focused and retention is a false indicator of a healthy organization. Companies never cared about your career, so why even pretend that’s an HR function? Performance reviews and decades-old systems are toxic productivity/morale killers. This book breaks down the culture, questions, structure and has so many practical really actionable ways you as a manager, executive, leader or yes, HR professional can refresh the way you and your teams work – today. Above I make a derogatory general statement about how awful HR has become. And having worked in large corporations a massive unionized institution I came to feel HR was a useless, impotent, almost evil function of business operation. In coming to a small team I found some solace that looking that one person in the eye and holding them accountable would allow me to reconcile my issues with this part of the world of work. That wasn’t true either. Thank you Patty for showing me how this was the other half of our baggage. How executives, managers and leaders have isolated and separated HR and HR functions to our detriment (and hubris). This book dives deep into the cash-money value of collaboration as well as many stories of exactly how we can rebuild a new operational model that includes “human” human resources. We are part of the problem, we must solve it together. Want to go deeper? Listen to this in-depth podcast with Patty by one of my favourite authors (Career Disruption Expert) Whitney Johnson OR watch this quick 3 minute video with Patty below. Either way, pick up this book. At the very least it will fill you with hope that the world of work has a future! A “Powerful” one.